Seinfeld puffy shirt episode. No puffy stock ties for me. Some stock ties are very plain, and in kind of icky fabrics. Some don't have the kind of "body" I'm looking for (my current stock tie is droopy from too many washings. Others are super-duper fancy -- meaning they look to be part of someone's wedding trousseau or straight from Grandma's parlour. A few look just like doilies. Early results sugges that my best bet is to go custom. Thankfully there are LOTS of custom stock tie makers, and they aren't that expensive!!! The going rate is about the same as the average off the rack tie. Dameron stock ties -- Being a fan of jewel-tones, I love the fabrics -- and the workmanship is lovely. You'll be pleasantly surprised by the pricing. It starts at $15 for chokers, $29 for stock ties, and $39 for shadbelly points that are out of this world. Ellerslie custom stock ties -- This seamstress operates out of NYC and she is at Devon every year selling blankets and saddle pads. Her work is impeccable and her pads wash beautifully. She can send you swatches via email or the actual fabric, and she has a great selection. Her site has no pricing, but it's not one of those "if you have to ask" situations. Each item is done to order and pricing depends on the fabric selected etc. I have two of her pads, and the prices were commensurate with the quality of the fabric and workmanship. Others -- these look good too! DivaDickies --(view site in IE if you have trouble in Chrome or other browser). Wow -- for $30, you get a custom, colorful dickie made to order! I am a fan of piping and she has piping in spades. Her color and fabric selections are all on the site, and they're quite extensive. Custom Stock ties -- Her focus on the site is holiday themes -- $30 -- but I suspect there are other options. Her selections are perhaps not geared as much to the dressage rider, but it's totally festive and would be great for exhibitions/demo rides. Fox-hunting Shop -- New fabrics every season, geared toward fox-hunters -- see the limited edition ties for under $20 (these are not pre-tied). Equineck -- the site might not be quite ready for prime time, but check out the samples and swatches from this UK site. I haven't tried to contact them to see if they're open for business, but if you're interested try emailing them at info@equineck.co.uk -- let us know what you find out! 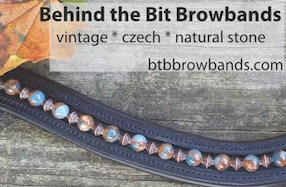 Browbands of Distinction -- These are priced in the $60 range but you can see the quality of the fabric and how nicely it complements the browbands that go with the ties. Sweet Gypsy Creations -- fancy and gorgeous, but definitely for the romantically inclined. In the $50-90 range -- Friesian and Andalusian owners, or anyone who loves the look of lace and detail work, take note of this site. Diamond Delight Clothing -- a wide range of custom rider's clothing, including hunt seat shirts ($36) with chokers, dressage shirts, and stock ties reasonably priced at $20. Stock Ties and More -- Start at $48. A Bit of Bling -- $48 for the pre-tied tie, and around $18 for the stock tie inserts -- a great option for those who want to swap out different tie accents. Woodstock Ties (Australia) -- Very pretty, silver and gold piping available. I've been trying to spread the word about Dameron stock ties. She used to ride w/ my trainer, so I saw them in person. GORGEOUS! I have one which is a white pre-tied type. It has white piping around the edge and the material has a contrasting white piping. It was one of the first she did in that style, but I think she does quite a few now. I look forward to being able to get matching stock tie/points from her someday, but I have multiple levels before that's an issue! Jumpers also buy her stock ties and points, and they may be more colorful. I know one of the mobile tack shops at the HITS circuits sells out and reorders them on a pretty regular basis. I'll have to check out Ellerslie - I'm on the wrong coast to have seen her in person! Super attractive options! I've thought about sewing a tie or two for myself - most of the usual suspects are just so blah. I can't wait to see which one(s) you pick! So nice to see some color and flair coming into fashion in the black and white worlds of dressage. I do love that choker.